Whether your business is just an idea to talk about with friends or a mature, publicly traded icon of industry, having a clear strategy is essential to survive in a competitive market. To adapt one of my favorite quotes from Ping Fu, it is more important to be clear than to be right. WHY does the business make money? i.e., what gap in the market does it fill? HOW does the business make money? i.e., what are the transactions that generate cash flow and margin for the business? What is our specific objective? What is our competitive advantage? i.e., how are we better, cheaper, or different than the alternatives? What are the relevant products in the market and their geographic coverage? Who are the buyers, suppliers, competitors, substitutes, and potential entrants? If the answers to these questions aren’t clear for your current business–no matter how big or small–think about it and spark some conversation. The answers will help you focus and might surprise you. If you have questions, feedback, or know where #1 & #2 come from, leave a comment! Collis, D. and Rukstad, M. “Can you say what your strategy is?” Harvard Business Review, April 2008, Reprint R0804E. Kaplan, R. and Norton, D. “Having trouble with your strategy? Then map it.” Harvard Business Review, September 2000, Reprint 000509. 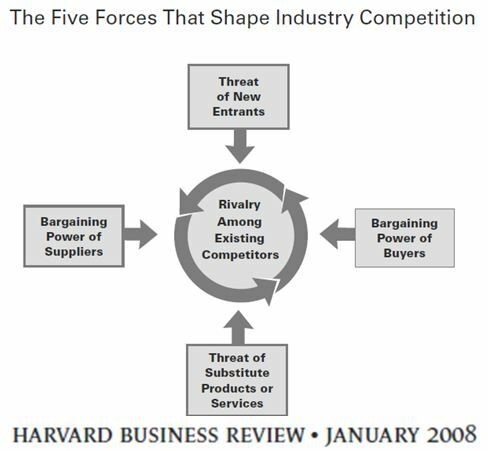 Porter, M. “The Five Competitive Forces that Shape Strategy.” Harvard Business Review, January 2008, Reprint 0801E. I particularly like this statement “it is more important to be clear than to be right”. It is similar to one of my strong beliefs – “A well-executed mediocre Strategic Plan will yield better results than a poorly-executed excellent Strategic Plan.” If one believes this, then the PROCESS used to develop the Strategic Plan should be focused around making sure the key players who have to implement the plan are totally committed to what it says. This is more important than the details of the Strategy itself. This is a great summary Ryan. You pulled together a lot of good ideas into these 9 questions. The final question pointing off to Porter’s 5 forces is a nice finish. 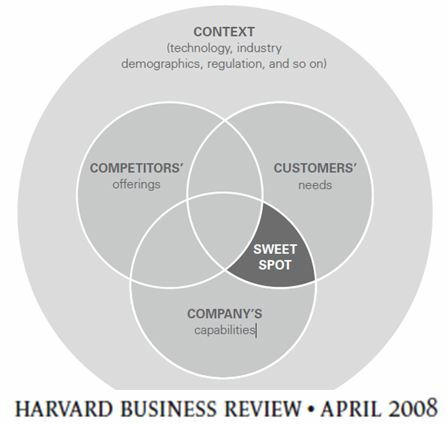 I hadn’t seen the “sweet spot” model before looks good.